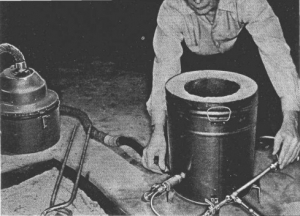 Homemade gas-powered smelting furnace intended to run on LPG. Refractory lining consists of firebrick pieces and refractory mix. Forced air is supplied by a vacuum cleaner.